Race smart, sticking to my race plan and conserving for second half of the marathon. Respect the altitude from a pacing perspective. Boulder is at approximately 5,400 feet elevation. For several weekends prior to the race, I had been going up to Tahoe (approximately 6,200 feet elevation) to try and dial-in my race pacing at altitude. However, under actual racing conditions, I knew that my pacing and nutrition would be put to a test. 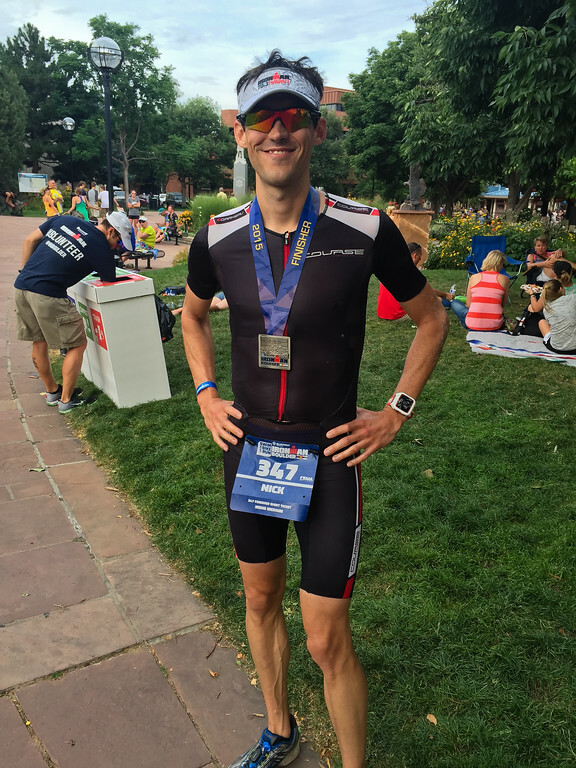 With this being my first full-distance Ironman and the unpredictability of altitude, I was hesitant to set any specific time goals. My hope was to race conservative, but to dig deep during the run when things got tough. I wanted to successfully balance pushing against the wall in the second half of the marathon versus being smart and not blowing up. It is a fine line that I hoped to be on the right side of. 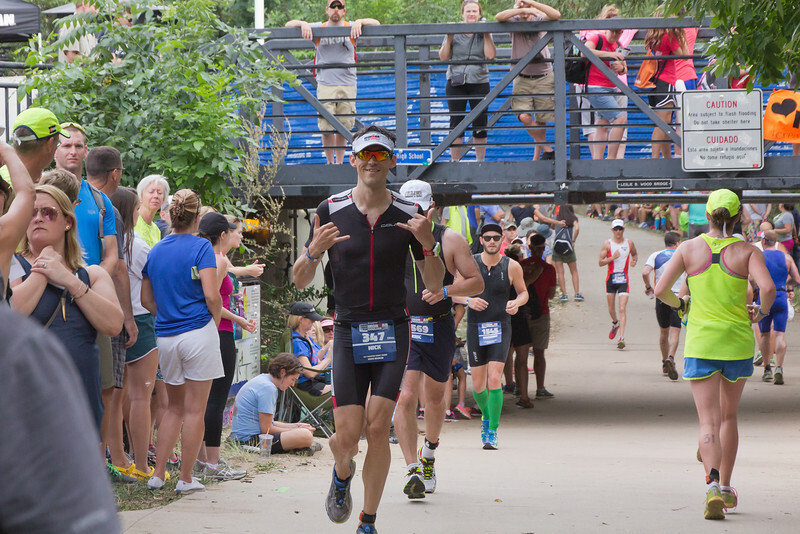 While I feel I have this balance dialed in Half Ironman distances, full-distance Ironman racing is a totally different beast that I was definitely respecting for the first time. After Ironman 70.3 Hawaii and the recovery week after in Hawaii, my original plan with Coach Coady was to shift to an Ironman-specific build period for 7-weeks leading up to Ironman Boulder. Unfortunately, I had some setbacks in that I got very sick with a flu-like virus halfway through my first week back. That put me completely out of commission for a week and a half with zero training hours. After finally getting back to training, I had a very solid last week in June (approximately 17 hours that week of training), and then promptly got food poisoning and again was out of commission for a number of days! The table below has my total volume of workouts during that 7-week period from 6/1 until the race. During this 7-week period, I only averaged 10:37 hours/week, which was quite low for an Ironman-specific build. 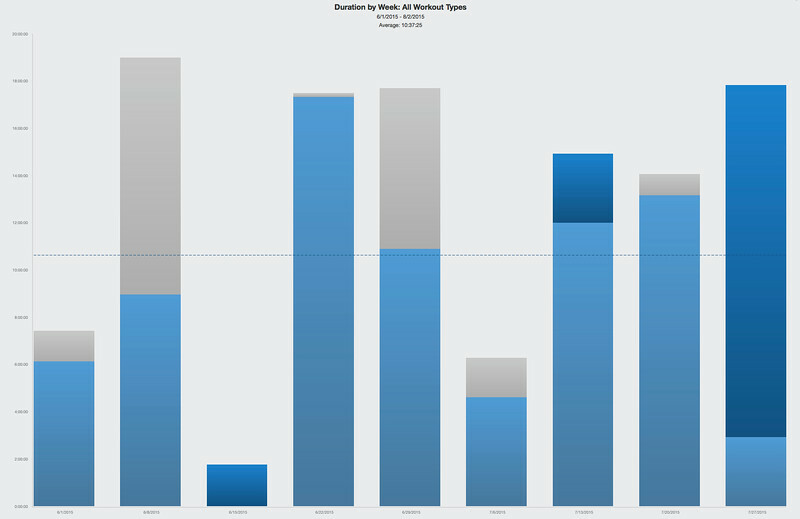 The second/third and forth/fifth weeks were impacted by illness and had significantly less training volume. On Friday, I checked in and picked up my race packets, and we generally walked around the expo. Both Sarah and I had a chance to try out some NormaTec Compression Boots, which were really cool and relaxing on the legs. We had a great dinner on Friday night out in Boulder. Saturday I had some pre-race sharpening with swim cords, followed by a 20-minute bike and 10-minute run, with some pickups to race pace. Saturday was extremely hot out, so I was getting worried a bit for race day. 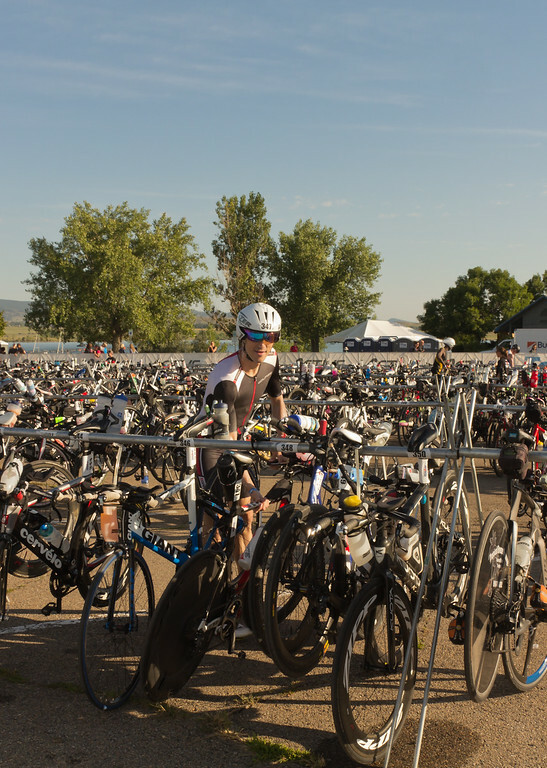 In the afternoon, I dropped off my T2 Run Transition Bag at Boulder High School, and then road over to the Boulder Reservoir and dropped off my bike and T1 Bike Transition Bag. Sarah cooked a great meal Saturday night and I was off early to bed Saturday night for the big day on Sunday! I woke up at 3:30 AM and had some strong coffee and a normal breakfast of steel cut oats with some blueberries and a banana. I also had a bagel with some peanut butter. I drank 20z of water with one Nuun tablet (345mg Sodium, 97mg Potassium, 13mg Calcium and 25mg of Magnesium) during breakfast, and generally sipped on another bottle (20oz) with Nuun for remainder of morning. I had a bottle of concentrated nutrition for the second half of the bike leg, which I froze solid and put in an insulated Camelback Polar Ice bottle. I dropped that off in my bike Special Needs bag, and Sarah and I boarded a bus going over to the Boulder Reservoir at 5AM. The bus system was very well run and efficient. Sarah is awesome for supporting me in these races – as getting up at 4AM on a Sunday is generally nuts! 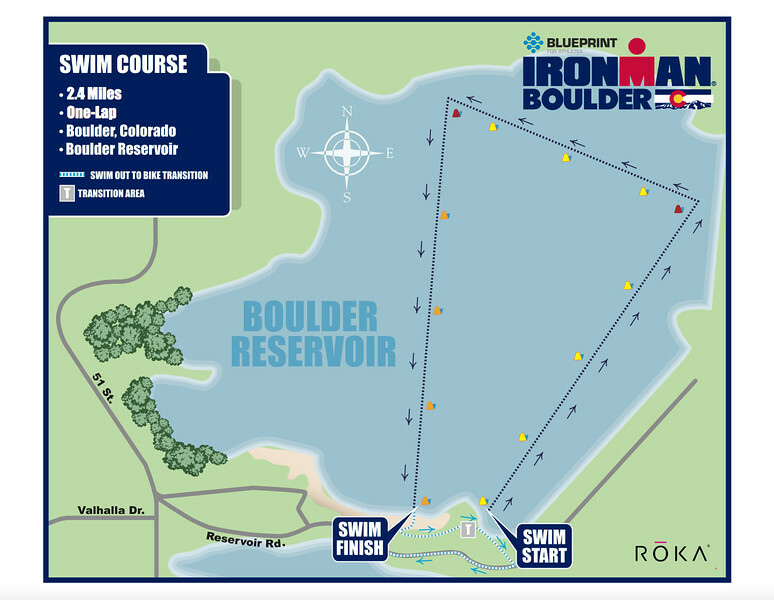 The 2.4-mile swim was located at the Boulder Reservoir, and all week leading up to the race the water temperature was fluctuating near 76.1 degrees (the “cut-off” for wetsuit legal racing). 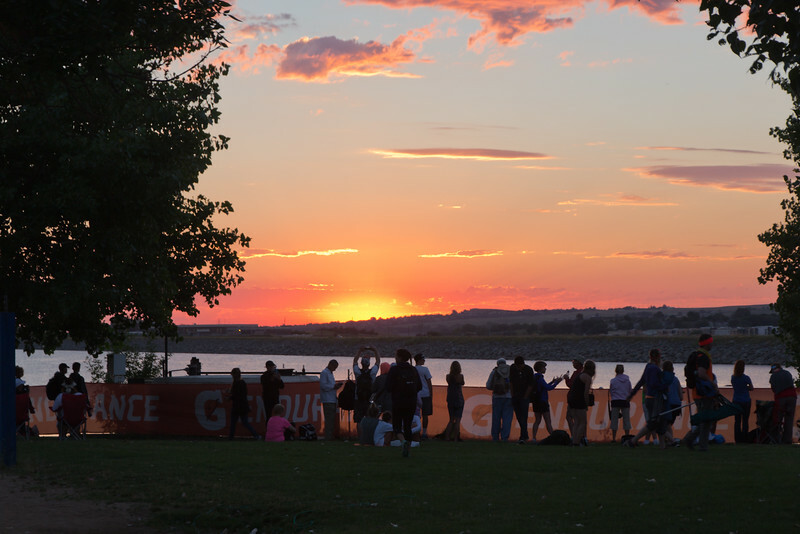 The morning of the race, the race director announced that the official temperature was near 78 degrees, meaning the race would not be wetsuit legal. To clarify, participants were permitted to wear wetsuits during the race, but they would not be eligible for awards, including World Championship slots. Fortunately, I had also brought my Roka Viper swim skin and decided to not wear a wetsuit given the announcement. Over half the participants ended up wearing wetsuits, and they were started behind the non-wetsuit swimmers. My only gripe was that the delay between non-wetsuit and wetsuit swimmers was not long enough, and as expected the bulk of fast swimmers wearing wetsuits ended up catching and effectively swimming over me at about the 2/3rds mark of the swim! Actually, it was not too bad in retrospect. The only other gripe is there is no way to really compare my swim time with others in my Age Group not wearing wetsuits, as the swim leg results are not really broken down that way. So while I have my overall ranking for my swim, I am not sure how it compares within the non-wetsuit group. 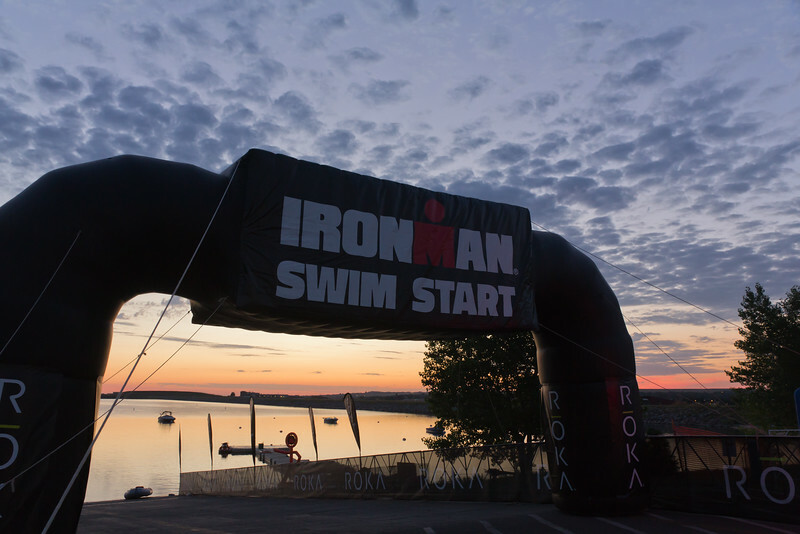 Although my swim time was certainly slower than it could have been if I wore a wetsuit, I actually felt pretty warm swimming even in the swim skin, so I think I would have likely overheated in a wetsuit so I was glad with my decision. Rather than a mass start, swimmers had to self-seed based on projected swim times. There were great volunteers holding up swim times in the corral. That was a consistent theme of this race – the volunteers were excellent and really make these races a perfect experience. I was running a bit late after dropping of my morning clothes bag, so I had to make my way through all of the wetsuit swimmers that were already lined up in the back. Fortunately, I made it in time and I lined up about halfway through the 1:00hr to 1:15 wave with the non-wetsuit group based on my projected swim time. Ultimately, my swim time of 1:19:19 was very slow compared to where I should have been coming in based on my fitness and pacing during training. I attribute that to a combination of (i) swimming in a fresh water lake without a wetsuit (which provides a ton of buoyancy and free speed when swimming), (ii) slower pacing due to altitude and (iii) generally super conservative pacing. Sighting – I swam a pretty good course as far as sighting the buoys and getting off feet if I felt they were going the wrong way. I don’t think I swam off course much at all. Fortunately, the sun was not an issue and it was very easy and clear to see the turn buoys. The swim course is a very large square essentially, with two left turns. Drafting – I was pretty successful in locking onto feet about 80% of the swim. Accordingly, most of the swim felt extremely “relaxed” to me. I say this may have worked as I think I drafted off the wrong feet and swam way too slow. This is a pro and con in that I saved a ton of energy generally, but also came out of the water about 10 minutes slower than I should have based on my swim fitness overall. Pacing – This is an ever improving area for me. I need to get better at open-water pacing, in particular when drafting. It is just such a difficult and “fine art” to balance swim power and effort. Meaning, I find the sliding scale of “perceived effort” hard in the swim as I tend to either (i) feel smooth and fine (i.e., under swim) or (ii) be totally gassed (i.e., over swim). I need to figure out that in-between stage. 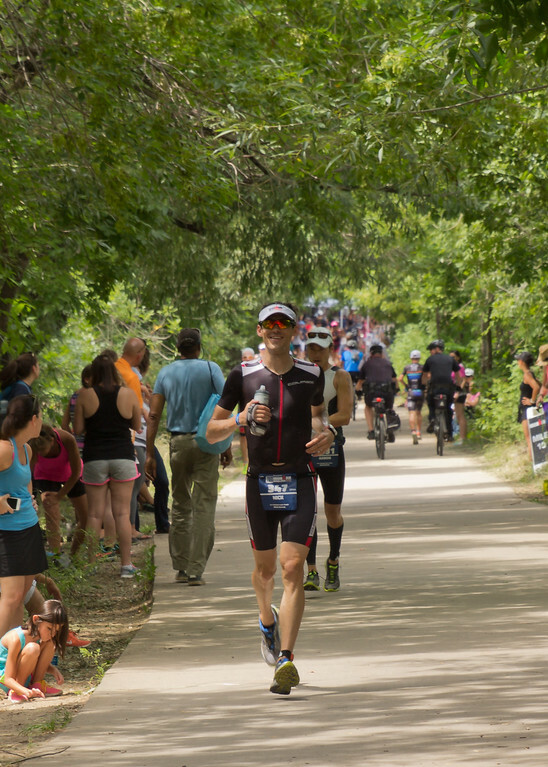 During this race, I was moving at a pace that felt pleasurable (seriously) the entire 2.4-mile swim. When I got out of the water, I didn’t feel remotely tired and honestly felt like I could keep swimming. At no point in the swim did I feel like I was breathing hard or pushing hard. During the actual swim I thought it was just the benefit of drafting – but once I saw my time I knew I swam way too easy. Ultimately, this is not a critical error during such a long race, but I really think I should have come in around 1:09 or so for this distance. Coming up the swim exit ramp, this was my first experience with the change tents found in full distance Ironman races. When you exit the water, you run towards the changing tent through the bike gear bags (which you drop off the day before). They are in numbered order and very easy to grab. In the change tent, I quickly dumped out my stuff and put on my bike helmet, socks and bike shoes (and pulled up my trisuit which I had rolled down underneath my swim skin). I chose to wear socks on the bike for this race, as there was a very long run in T2 from the bike dismount line and I knew the year prior the pavement was very hot. Flying Mount – I didn’t mount my bike shoes in the pedals for this race, so I had to put them on in the changing tent and run in them all the way to my bike. I had a pretty good bike racking spot in the far corner, right next to where you exit the bike area and head up the hill to the mount line. While this minimized the amount of distance I had to run with my bike, it was still a very long run from the changing tent to the mount line. While it was certainly not the end of the world, running in bike shoes is very inefficient and I just need to practice flying mounts. I could have saved some time just running in socks and jumping on my bike with shoes already clipped in at the mount line. I am going to practice this during the off-season. All things being equal, I had a great bike split as a ratio of (i) time to (ii) effort. I rode extremely conservative, and frankly under-biked significantly with the hope of saving my legs for a strong marathon. 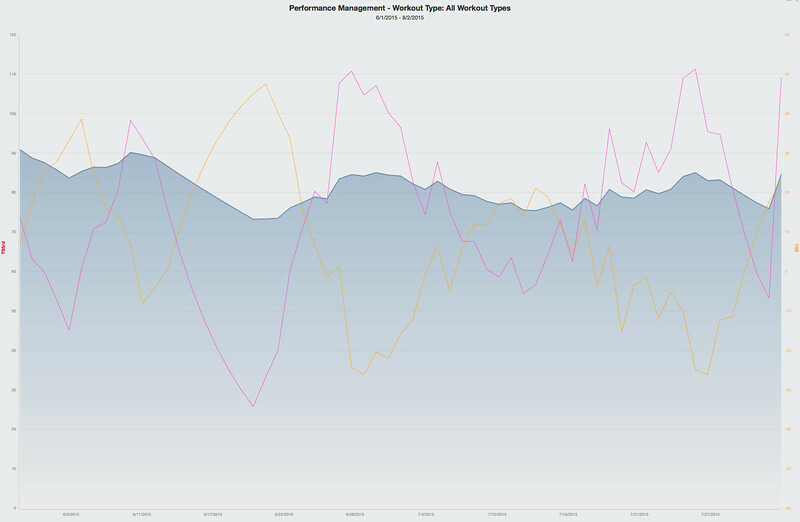 I ended up riding Normalized Power of 155watts during the bike leg, which is only an intensity factor of ~55% for me. This is quite low, but skewed significantly by my race pacing plan which I detailed below. Still, it was good that I managed to pass 41 guys in my Age Group, and over 357 people in total on the bike split after my slow swim. 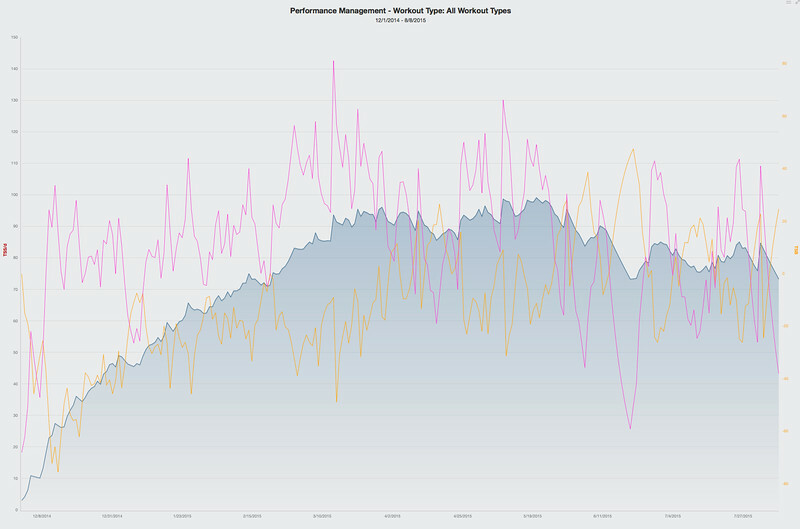 Here is a link to my TrainingPeaks bike leg race file. 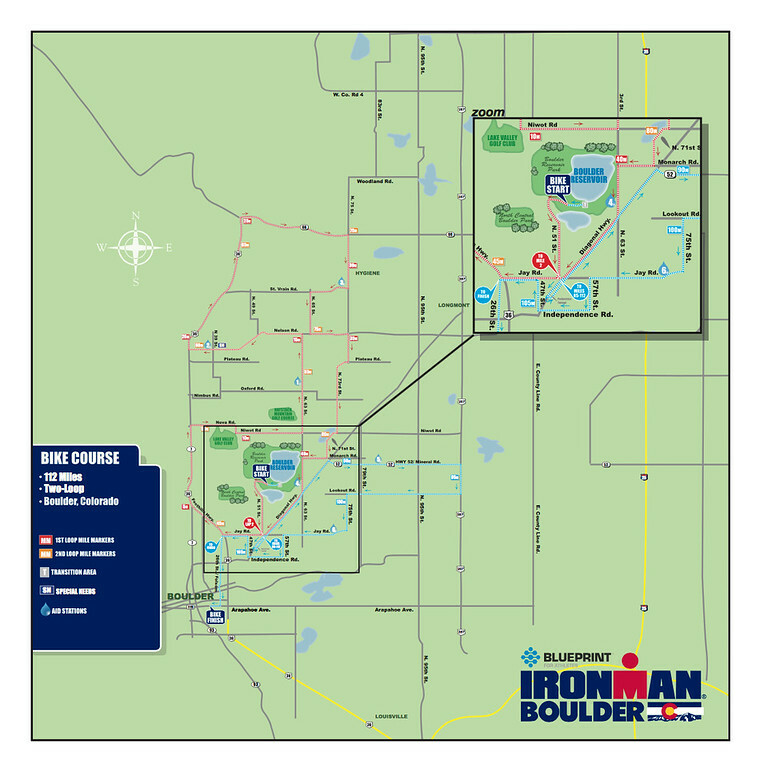 The Ironman Boulder Bike course is a 112-mile multi-loop course with plenty of rolling hills and approximately 5,100 feet of total elevation gain. As noted in my TrainingPeaks file linked above, I only recorded 109 miles and approximately 4,400 feet of total elevation gain. However, my Garmin elevation has been acting up significantly recently, so that is a post-race GPS adjusted recording and likely not actual. My race plan was to bike conservative and cap myself around 185 watts for flats and normal speeds, 200 watts for moderate hills and 225 watts for steep hills. 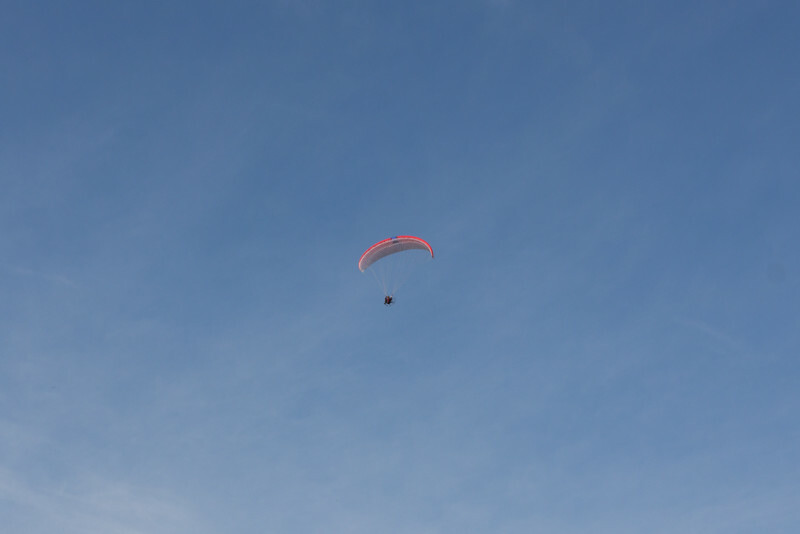 However, on descents my plan was to back-off power and stay aero for speeds in excess of 25mph and to completely coast for speeds in excess of 30mph. Due to the elevation profile of the course, I was able to coast huge down hills at high speeds, and largely “bank” watts and heart-beats by exerting little energy during those descents. Those huge periods of little watts greatly skewed/lowered my Normalized Power. On the flat and at normal speeds, I also found myself settling into around 170 watts, so a bit lower than my cap. From a nutritional perspective, I ended up drinking way more basic hydration than I was planning. My general hydration plan was to drink approximately 24oz/hour of water with one Nuun tablet. Each Nuun tablet has (345mg sodium, 97mg potassium, 13mg calcium and 25mg of magnesium). I would take hand-ups at aid stations to refill my water and use extra water at each aid station to dump all over me to start very early on maintaining heat management. In reality, I felt very “thirsty” on the bike and continually drank to thirst – which ended up likely in the 40oz/hour range! I had absolutely no gastro issues on the bike and felt completely comfortable and fine, but I think that much hydration ended up leading to my “bloating” issues later on the run which I described below and impacted my run significantly. In thinking about this after the race, I attribute this a lot to the altitude, as every one of my TriForce teammates indicated how dehydrated they felt at altitude. 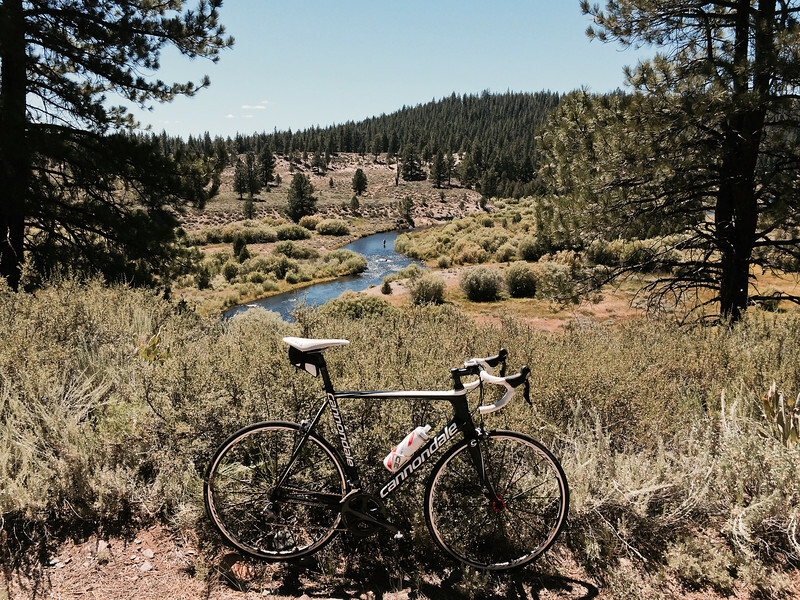 The air was very dry in Boulder, and it was blazing hot on the bike. So I think that lead to me taking in way too much water. Power Caps – As noted above, I was super conservative and always stuck to my power caps on the climbs. I felt that I didn’t have a ton of spikes in power. Heat Management – It was very hot on the bike, but I was very good at each aid station about taking a bottle of water and dumping it inside of my helmet and all over my back and front. This really helped keep me cool on the bike. Under Bike? – This is always a tough debate, as I was super focused on holding back for the run. However, when looking at my power analysis in TrainingPeaks, I was super conservative and ended up with a Normalized Power of only 155watts. This is very low and should have set me up for a super strong run (which, unfortunately, I didn’t have – but I think it was due to pacing too conservative on the run as well and gastro issues). Ultimately, I think I needed to push the bike more as I have strong bike fitness and could have gained some significant time. Hydration – As noted above, I think I ended up drinking way too much out of fear of dehydration at altitude. In retrospect, I think this was a direct cause to my nutritional problems during the run later. A largely uneventful second transition. I came into town on the last drag and got my feet out of my shoes while biking for a flying dismount. There was a long run from the dismount line to the Boulder High School track where we handed our bikes off to volunteers. Fortunately, I wore my socks in the bike as most of this run is on hot concrete. Last year, the track (which is black) was apparently scorching hot and burnt a lot of racers feet. This year, they had that portion and the bridge crossing prior covered in carpet. Still, I am very glad I wore socks on the bike for this race and would recommend the same to others. Looking back now, my run split was super disappointing and nowhere near where I should be running an Ironman marathon. My average pace ended up 10:05/mile, but that included walking at aid stations (sometimes upwards of 1 minute per aid station) and also a bathroom break half way through the marathon. Here is a link to my TrainingPeaks run split race file. Even with the walking and bathroom break, I was still running way too slow for where I think I should be. 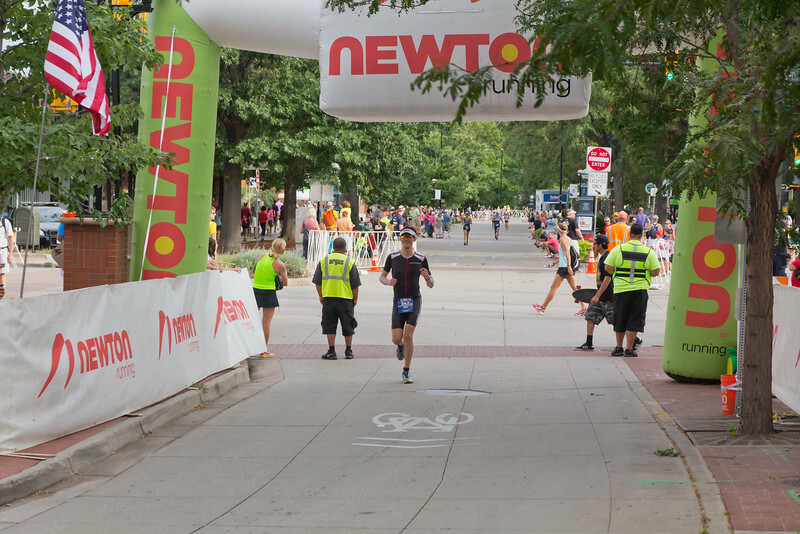 The 26.2-mile marathon course was dubbed “The Flux Capacitor” as it is a multi-loop course with several out and backs, with approximately 670 feet of total elevation gain. First, let me say running at altitude is tough when you are not entirely acclimatized. Second, it is important to note that we were extremely lucky this year that cloud cover came in and it even slightly rained a bit. This dramatically cooled off temps and it otherwise could have been super hot during this run. Still, run times across the board looked slow in this race. Even despite my personal slow pace, I was able to pass 17 men in my Age Group, and 87 racers overall during the run. First 5 Miles, cap my pace at 8:35m/m (targeting around 8:40m/m – if I see 8:35m/m slow down, and if I see 8:45m/m speed up). Walk 0:20s each mile. For Miles 6-13, assuming I am feeling good cap my pace at 8:30m/m (targeting around 8:35m/m – if I see 8:30m/m slow down, if I see 8:40m/m speed up). Walk 0:20s each mile. For Miles 13-20, try and push to hold 8:25m/m (cap at 8:20m/m). Walk 0:20s each mile. Note: This was my altitude-adjusted pace that in training I could go run 13-15 miles at and not even break a sweat or breath hard. I thought this was a completely attainable goal pace prior to the race. Little did I know! Not including the 0:20s I walked at each aid station, my average paces for the first 5 miles was near 8:40-ish and I was feeling good. Around Mile 6, however, my stomach started to really feel “bloated” and I was having trouble keeping my pace up as I was worried about getting sick. In an effort to keep calories down, I (i) intentionally slowed my pace into the 9m/m marks and (ii) I stopped drinking Coke and switched to water with a handful of pretzels at each aid station. I also ended up walking aid stations much longer than 0:20s in an effort to stay cool (i.e., more water over the head and ice) and ensure I could get the pretzels down and drink plenty of water. 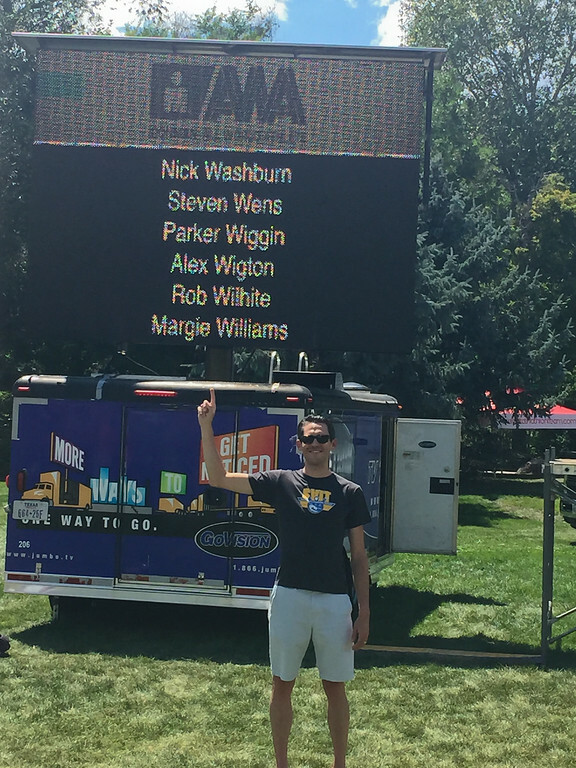 Although very hard, the spectator support on the Ironman Boulder run course was outstanding. 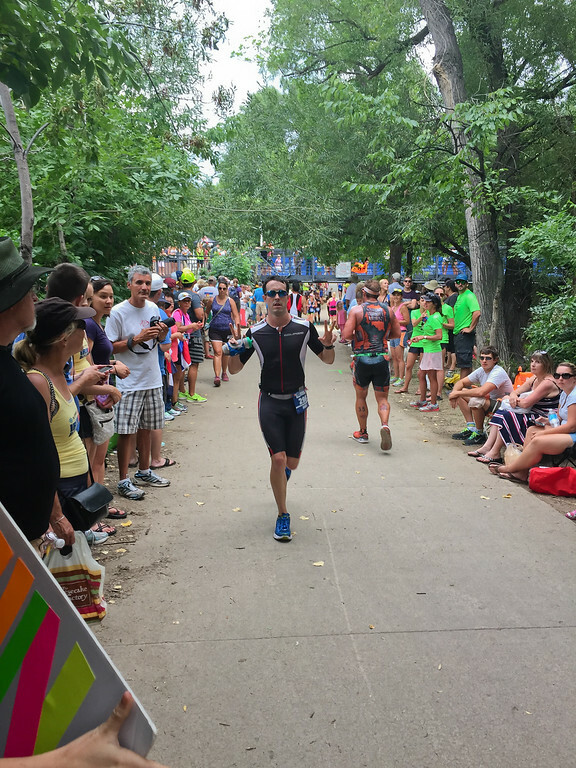 Because it is a multi-loop course along the Boulder Creek Path right through town and next to the University, the sides are lined with thousands of spectators cheering you on. There were great sections with big groups with stereos blasting tunes and it was a real pick-up. The volunteers are also excellent at the aid stations. During the run, I saw a number of other TriForcers out there, including Chai, Brennan, Saurabh and Alex. Everyone was good about shouting words of support. Really, our team had a very strong showing out there. I knew while running that my pace sucked, I was walking way too long and generally just plodding along. What I am most frustrated about in retrospect is that I left way too much on the table. With this being my first full-distance Ironman, I was focused on running conservative and not blowing up. As a result, I never really “pushed it”, so to speak, until the last two miles or so. When I got to the 24 mile mark, I saw Chai from TriForce and he yelled at me to dig deep and finish strong. I ended up running the last two miles at an average pace of 7:44m/m and I felt like I was flying. That was a great pick up to move at a strong pace. The crowd support got even louder as they yell out your name from your bib – and I think my pace looked like sprinting at that point. At the finish line I was elated to have finished my first ever full-distance Ironman, and I was already plotting when my next one would be! I knew at that point I raced too conservatively, as had I raced harder I probably would have been in a very dark place! Even after digging for the last two miles, I was not really breathing crazy hard and stood there having a conversation with Sarah. Chai came in about 1 minute behind me for a very strong finish, and we grabbed some food and talked about the race. Chai also had gastro issues on the run that significantly impacted his run pacing. Heat Management – Fortunately, the clouds and rain came in so this was less of an issue. Still, it was in the 80s and I was very good about dumping water and ice all over myself at each aid station to manage heat. 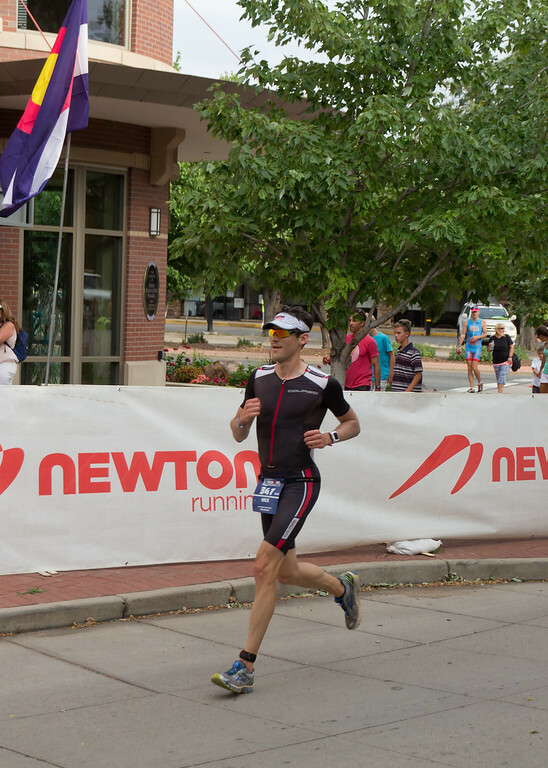 Flexibility with Nutrition & Race Plan – I was pleased that I was able to recognize gastro issues were starting, and quickly modify my pacing and hydration/nutrition to counteract it. Nutrition – As noted above, although I successfully changed it up, my race plan of sticking to 20z of Coke every 45minutes did not work and I think I ended up with way less fuel during the run than I needed to hold pace for a tough marathon. I need to continue to fine-tune my strategy through more trial and error. 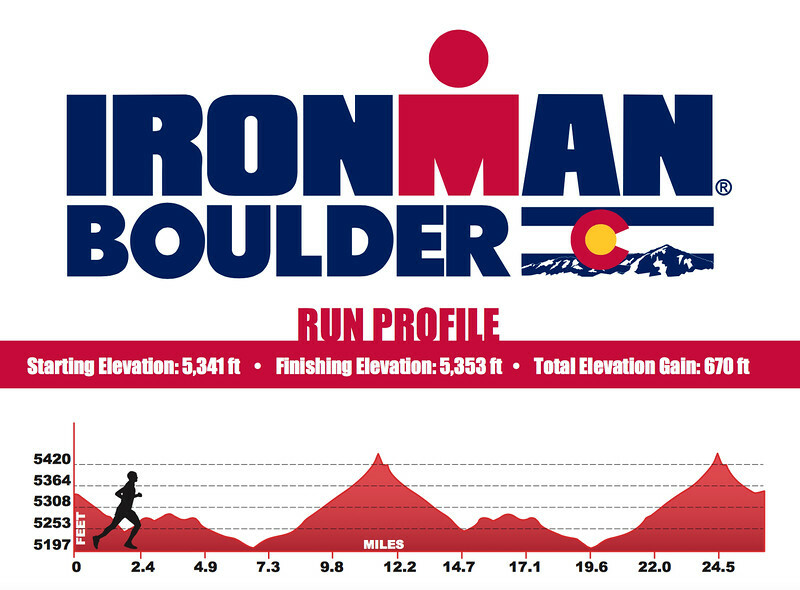 Racing an Ironman distance race that is not at altitude will be a good litmus test on my strategy. Race Plan Pace / Not Digging Deep Enough – I clearly was nowhere near the pacing I had been targeting, which I honestly thought were conservative (in particular, after a very conservative bike split). Although I speed up the last 2-miles, in retrospect I should have dug deeper the bulk of the marathon and pushed myself harder. Ultimately, this was my first full-distance Ironman so I was hesitant to risk blowing up and really tried to race conservatively. This is a fine line that will take years to develop through trial (and likely error). You never really know, and while I sit here typing this with 20/20 hindsight, it is tough to truly say given the conditions of the day. Obviously, if I felt I could have easily ran faster, I probably would have!!! 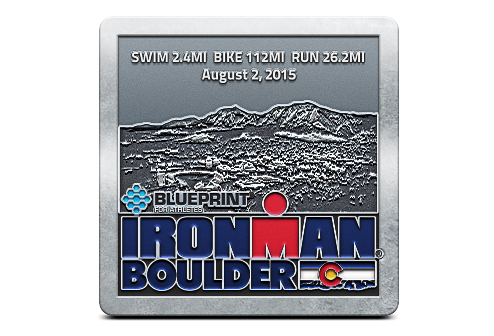 Ultimately, I had a BLAST at Ironman Boulder with Sarah and the whole TriForce crew. A special thanks to Coach Coady at TriForce Triathlon Team for really helping me with my training, in particularly with huge setbacks during the build due to my illnesses. I know I will continue to make great strides with Coach Coady helping out. I also loved supporting the other TriForcers out there – it is great to approach these races with a team vibe. 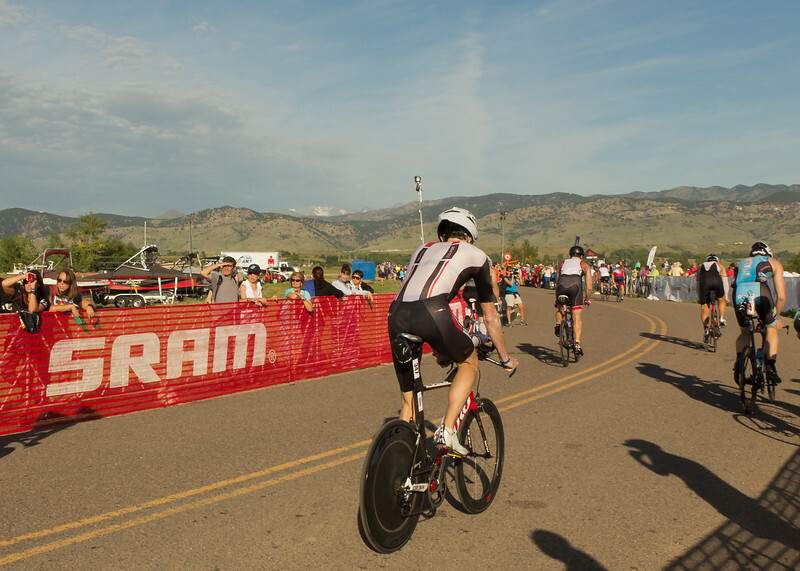 Ironman Boulder is an outstanding race that is extremely well run, with amazing community support. The volunteers were super helpful and enthusiastic, and the spectator support at the race was better than any I have encountered at another race. 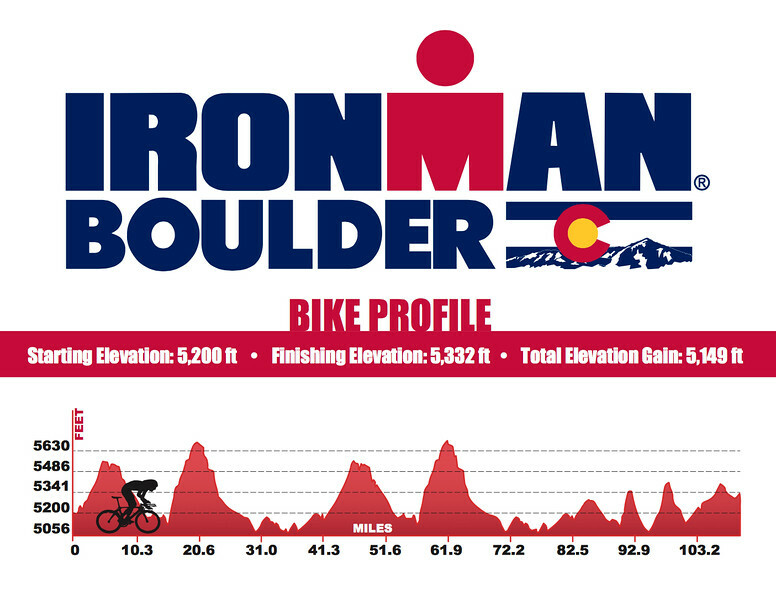 Boulder is a tough race at altitude, but I am very happy I signed up for this as my first full-distance Ironman. And don’t get me wrong, I am very happy with 11:18:15 for my first Ironman, putting me at top 20% in my Age Group and top 10% in the race overall. But this wouldn’t be as fun if I couldn’t sit here and focus on what to improve!!!! That is what I like best about all of the training this takes. Accordingly, now I just need to focus on figuring out my nutritional issues and pacing to set up a fast run. I should be able to run ~3:45 marathon in a full-distance Ironman, and that will definitely be the goal for future races. My primary focus next season is to get even faster at the Half Ironman distance, hopefully consistently finishing in the ~4:40 range. I think that is attainable, albeit with a lot of hard work. And as usual, Sarah has been extremely supportive throughout this process and I love seeing her out on the course cheering me on! Congrats on a great first IM! The future is bright! Keith – the amounts listed are per bottle. Before each drink, you want to shake it up a bit to get the contents mixed. But it just comes out like a thick drink. Not like a gel, more like a normal drink with a lot of powder in it (i.e., like a watered-down milk shake more or less). The key is to pre-mix it out of the bottle at home first. I fill up the bottle with water 1/2 way and then dump that into a big bowl. I add the Nuun to let it dissolve. Then I add the scoops, using a whisk to mix it in. If you just put it all in the bottle first, it will never really mix well. Once I have whisked it nice, I pour that into the bottle. Then I just add whatever more water is necessary to top off the bottle. Even with the pre-mix, it tends to settle at the bottom during the ride. So just ensure to shake for 2-3 seconds before drinking. Note: You definitely want to keep it refrigerated after mixing (if you do it the night before) – as anything with protein can sour if it gets hot. That is also why I freeze my special needs bottle. Thanks for the info and tips Nick!